Therefore if any man is in Christ, he is a new creature; the old things passed away; behold, new things have come. Now all these things are from God, who reconciled us to Himself through Christ, and gave us the ministry of reconciliation, namely, that God was in Christ reconciling the world to Himself, not counting their trespasses against them, and He has committed to us the word of reconciliation. Therefore, we are amabassadors for Christ, as though God were entreating through us; we beg you on behalf of Christ, be reconciled to God. He made Him who knew no sin to be sin on our behalf, that we might become the righteousness of God in Him. Beloved, if our heart does not condemn us, we have confidence before God; and whatever we ask we receive from Him, because we keep His commandments and do the things that are pleasing in His sight. And this is His commandment, that we believe in the name of His Son Jesus Christ, and love one another, just as He commanded us. And the one who keeps His commandments abides in Him, and He in him. And we know by this that He abides in us, by the Spirit whom He has given us. And she will bear a Son; and you shall call His name Jesus, for it is He who will save His people from their sins. BUT RECEIVING A NEW LIFE." According to Psalm 99, where should you worship the Lord? dc3tog is a double crochet decrease over 3 stitches. without completing the very last step of each stitch. which makes the 3 stitches 1. Choose your project tote bags carefully. Totes that close with velcro or zippers are bad for your yarn. Hello! I was writing to thank you for the pattern! It makes me laugh whenever I see my little one in her new outfit! 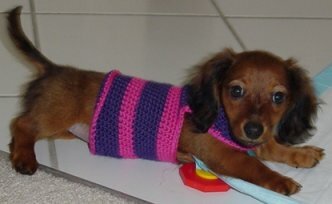 Here is a picture of Lola in her sweater! I hope that you'll add it to your gallery! Thanks again! The second sweater that I created, I started my chain off with 54 vs. 70. It was a little big around Angell's waist. The 16 chain for the neck is perfect for her. If you would like, I would be more than happy to email you a few pictures of Angell in the sweaters. You are more than welcome to post them on your website. Angells is real pretty. The first one is white with mauve bobbles. The second is dk. green with white bobbles. With the second sweater I included bobbles around the neck part of the sweater. I sewed them right along with the Hdc. SO PRETTY! I wanted to thank you for the FANTASTIC pattern. I am making 2 more for Angell (this way I will always have a clean one for her). She has NEVER worn a sweater before and she loves them! She wagged her tail once it was on. She pranced around the house like she was a puppy again. I was afraid that she would be bothered by it, but she loves it! Thanks again! If you wanted pictures for your website, please let me know. It was so wonderful to come across your website and read about your testimony pertaining to your walk with the Lord, and also to see how God is taking care of you, your husband and your family. I too crochet, and have since I believe perhaps close to the same age as you. My Mom's sister (my aunt who is 80 now) showed me how. I taught myself later to knit, but don't do very much of it...am trying my hand at it again. I gues you might say I've had a ministry of making baby afghans (crochet and a few quilted) for folks along the way of life who have had babies. I enjoy giving and I give God praise for the ability and the hands to work. Thank you so much for the work, effort, time, blessings, etc. you've expressed in your website. It's beautiful and I'm so much enjoying it. God bless and be with you all. I love your sweater design. I have made the one with no leg holes for my Shiz-zuh mix and one each for two Chihuahuas in the family. Chica loves her sweaters. Although when I first put them on her, she gives me an indignant look that says, "Mommy, you have to be kidding me! My friends will laugh at me if they see me." They help keep her warm. The sweaters for the Chihuahuas are great. My Grandfather has only one arm and Chuey's sweater is great for hem to put on and off. I will work on getting pictures of the "kids" in their sweaters for you to see how great they turned out. Hi. I came by to find free crocheted christmas patterns on placemats and doilies...plus other Christmas ideas in crocheting. I love getting this in my E-Mail, and love looking for some new things to do. I have been crocheting for a long long time. Thank you and god bless you for having a place for people like me to go to for free things to do. I truely enjoy comming here and looking at new things to do. i love this site, it has every thing needed for crocheting. 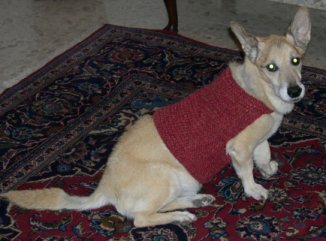 Here is the picture of my lovely dog Netz, wearing his sweater. Just letting you know what a wonderful pattern this was for my new puppy. Had to size it down a bit...but it works great AND stays on her. I did add a little ruffle at the neck and tummy edge (since she is a girl). Thought maybe you'd like to see her picture with her new sweater on. Thanks very much for the great pattern. And as she grows I will make many more I'm sure. Thank you so much for having the free patterns. I found just what I was looking for and more. May God Bless You! trouble putting them together into an afgan. I love your website and your dedication to the Lord! Great Site! 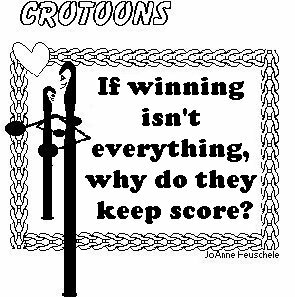 I needed a quick answer to a crochet question and found this site. Had my answer in about 30 seconds flat! Thank you for being here. And yes, I do know Him. Thank you for that too. husband exploded, "If it weren't for my money, the house wouldn't be here!" Four old men were out golfing. bethankful we're still on the right side of the grass!" "Would you like to listen for a different word?" uniform that I wear when I work." The child, still staring, asked, "Do you have a boo boo?" telling him that it was also part of his uniform. what this says! 'Kills fleas and ticks for up to six months'!" A NEW NINTENDO... I PRAY FOR A NEW VCR..."
little brother replied, "No, but Grandma is!" way to the funny farm." to ask how things were going. "Superb! I can't believe it," the young mother said. the kids don't bother me for hours!"